28 UCW JULY 2-8, 2014 WWW.UPANDCOMINGWEEKLY.COM Stop. Think. Put Safety First. 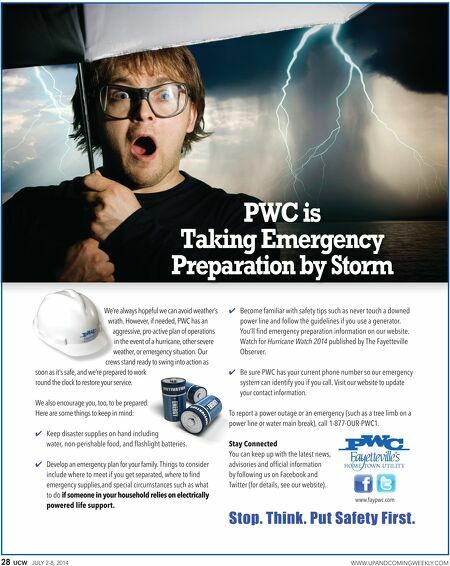 www.faypwc.com PWC is Taking Emergency Preparation by Storm We're always hopeful we can avoid weather's wrath. However, if needed, PWC has an aggressive, pro-active plan of operations in the event of a hurricane, other severe weather, or emergency situation. Our crews stand ready to swing into action as soon as it's safe, and we're prepared to work round the clock to restore your service. We also encourage you, too, to be prepared. Here are some things to keep in mind: 4 Keep disaster supplies on hand including water, non-perishable food, and flashlight batteries. 4 Develop an emergency plan for your family. Things to consider include where to meet if you get separated, where to find emergency supplies,and special circumstances such as what to do if someone in your household relies on electrically powered life support. 4 Become familiar with safety tips such as never touch a downed power line and follow the guidelines if you use a generator. You'll find emergency preparation information on our website. Watch for Hurricane Watch 2014 published by The Fayetteville Observer. 4 Be sure PWC has your current phone number so our emergency system can identify you if you call. Visit our website to update your contact information. To report a power outage or an emergency (such as a tree limb on a power line or water main break), call 1-877-OUR-PWC1. Stay Connected You can keep up with the latest news, advisories and official information by following us on Facebook and Twitter (for details, see our website).